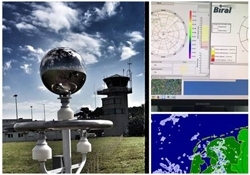 Biral, a leading manufacturer of meteorological sensors, has completed the installation of its BTD-300 Thunderstorm Detector at Eindhoven Air Base in the Netherlands, a military transport base for the Royal Netherlands Air Force. The BTD-300 Thunderstorm Detector is a standalone sensor that reliably detects the presence of all forms of lightning to a range of 83km (52 miles). The unique quasi-electrostatic operating principle gives the detector a very low false-alarm rate and the ability to warn of the risk of overhead lightning. The ability to reliably detect and range cloud-to-cloud lightning, which is typically much more common than cloud-to-ground strikes, makes the BTD-300 much more sensitive to the presence of storms compared with devices that rely on radio detection. The electrostatic operating principle allows the sensor to warn of the risk of overhead lightning before the first discharge occurs. For the military, having a local hardwired, dedicated warning system is a significant benefit over a regional networked solution, which relies upon internet and mobile communications to issue warnings.